Fall is an amazing time of the year in the West. The warm summer days give way to brisk, cool weather for all the animals to enjoy and to prepare for a sometimes harsh winter. 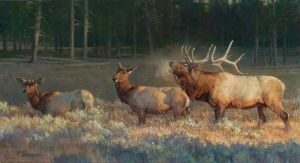 This bull elk bellows into the crisp morning air as he gives his "Wake-up Call" for all to hear. With the bull and his females in tow, the herd grazes in the fresh, lush grass just before the sun ushers in a new day of activities.